It's now uncommon in the UK because of the effectiveness of vaccination but there has been a recent rise in cases at festivals, including Glastonbury Festival leading to a reminder for people to get vaccinated. Anyone can get measles if they haven't been vaccinated or they haven't had it before, although it's most common in young children. You can easily catch measles by breathing in these droplets or, if the droplets have settled on a surface, by touching the surface and then placing your hands near your nose or mouth. The virus can survive on surfaces for a few hours. 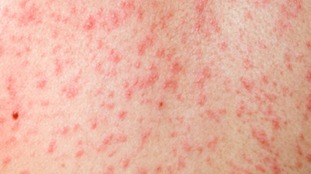 People with measles are infectious from when the symptoms develop until about four days after the rash first appears. Should I contact the doctor? Get in touch with your GP as soon as possible if you suspect measles. It's best to phone before your visit as your GP surgery may need to make arrangements to reduce the risk of spreading the infection. You should also see your doctor if you've been in close contact with someone who has measles and you've not been fully vaccinated (had two doses of the MMR vaccine) or haven't had the infection before. Once you've had measles, your body builds up resistance (immunity) to the virus and it's highly unlikely you'll get it again. If the MMR vaccine isn't suitable, a treatment called human normal immunoglobulin (HNIG) can be used if at immediate risk of catching measles.